Known as the Joy to Abundance Strategist and TV Happiness Coach, MarBeth Dunn has a huge mission; to bring joy and happiness to millions. Executive Producer and Host of Having it ALL! TV, and Founder of the Institute for Empathic Development, MarBeth is an empath and intuitive, who can accurately pinpoint the hidden issues preventing you from living the possibility filled life you richly deserve. She has developed a powerful system that facilitates miracles, empowering you to access prosperity and success quickly and easily. MarBeth is the co-author of international Best Seller “Start Right Marketing” and Best Seller, ” Conversations That Make a Difference” She is the former host of Having it All with MarBeth on the Law of Attraction Radio Network, and Founder and past President of the Miami Holistic Chamber of Commerce. 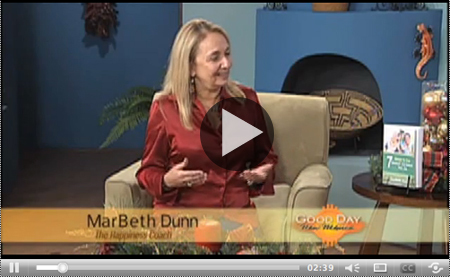 See MarBeth bringing Joy and Happiness on TV! Her inspiring work has been featured on several television networks, including FOX, NBC, CBS, and WEYW 19, Key West, where she is a frequent guest. – MarBeth shares tips to avoid the holiday blues on Good Day New Mexico, KOB 4 Albuquerque. MarBeth Dunn is available for TV, radio, telesummits, speaking engagements, and appearances. Looking for Happiness Tips such as, “Joyful Tips and How to Avoid the Holiday Blues”, “How to live a Successful, Joy-Filled Life” and more. Marbeth happily tailors her interview and speaking topics. MarBeth Dunn, founder of The Institute for Empathic Development, is known as the Joy to Abundance Strategist. She is an empath, intuitive, speaker, co-author of Amazon best seller, Conversations that Make a Difference: Shift Your Beliefs, President of the Greater Miami Holistic Chamber of Commerce, coach, mentor, TV Happiness Expert, and host of Having It ALL TV. Her inspiring work has been featured on FOX, NBC, CBS, The CW in San Diego. She has been a regular guest on Good Morning Florida Keys. I met MarBeth at a time my loved ones and I were experiencing grief from death, disease and divorce. She gave me a sense of encouragement to see these events as an opportunity for personal and spiritual growth. I highly recommend MarBeth for her compassionate approach and expertise. Your Gift has removed issues that would have taken years to uncover and process. You are also very good at identifying issues that I thought I had processed completely and released. You soon realize that she is connecting with you on multiple levels with deep understanding and empathy. What is immediately felt is the aura of love and non-judgment, which surrounds you, even if you are on the other end of a telephone thousands of miles away. There is no distance. MarBeth has permanently changed my life. She will change yours.